Not to be confused with Cooper's Hawk Winery & Restaurants. The average mass of an adult male ranges from 220 to 440 g (7.8 to 15.5 oz) with a length between 35 and 46 cm (14 and 18 in). The adult male is significantly smaller than the average female, which weighs 330 to 700 g (12 to 25 oz) and measures 42 to 50 cm (17 to 20 in) long. Its wingspan ranges from 62 to 94 cm (24 to 37 in). Individuals living in the eastern regions, where the sexes average 349 g (12.3 oz) and 566 g (20.0 oz), tend to be larger and heavier than those in the western regions, where the respective sexes average 280 g (9.9 oz) and 440 g (16 oz). Cooper's hawks have short rounded wings, the wing chord measuring 21.4–27.8 cm (8.4–10.9 in) long, and a relatively long tail, 17–20.5 cm (6.7–8.1 in) long, with dark bands, round-ended at the tip. As in most accipiters, the tarsus is relatively long, measuring 5.6–7.6 cm (2.2–3.0 in) long, and the bill is relatively small, with the culmen from the cere measuring only 1.5–2.1 cm (0.59–0.83 in). Adults have red eyes and have a black cap, with blue-gray upper parts and white underparts with fine, thin, reddish bars. Their tail is blue-gray on top and pale underneath, barred with black bands. Immatures have yellow eyes and have a brown cap, with brown upper parts and pale underparts with thin black streaks mostly ending at the belly. Their tail is brown on top and pale underneath, barred with dark bands. The eyes of this hawk, as in most predatory birds, face forward, enabling good depth perception for hunting and catching prey while flying at top speeds. They have hooked bills that are well adapted for tearing flesh of prey. 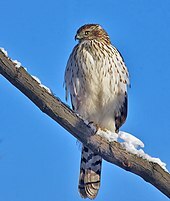 Immatures are somewhat larger than a sharp-shinned hawk and smaller than a northern goshawk, though small males nearly overlap with large female sharp-shinned hawks, and large female Cooper's hawks nearly overlap with small male goshawks. Although the coloration is generally somewhat similar between sharp-shinned hawks and Cooper's hawks, Cooper's appear broader-chested and larger-headed, with generally more robust features. The crow-like size of Cooper's hawks is sometimes distinctive from the sharp-shinned, but this can be less reliable in large female sharp-shinneds. Goshawks are usually more distinctive in their larger size and differing plumage markings, with the juvenile goshawk having broader, darker streaking below with more irregular patterns than the immature Cooper's. The Cooper's hawk appears long-necked in flight and has been described by birdwatchers as looking like a "flying cross". The Cooper's hawk is seen mostly flying with quick, consecutive wing beats and a short glide, though they may also soar. These birds capture prey from cover or while flying quickly through dense vegetation, relying almost totally on surprise. One study showed that this is a quite dangerous hunting style. More than 300 Cooper's hawk skeletons were investigated and 23% revealed healed fractures in the bones of the chest. Cooper's hawks prey almost exclusively on small to mid-sized birds. Typical prey species include American robins, other thrushes, jays, woodpeckers, European starlings, quail, icterids, cuckoos, pigeons and doves. They may also prey upon the raptor American kestrel and other smaller raptors, including their cousin the sharp-shinned hawk. They have been known to rob nests and may supplement their diet with small mammals such as chipmunks, hares, mice, squirrels, and bats. Even more rarely, they may prey on lizards, frogs, or snakes. It normally catches its prey with its feet and kills it by repeatedly squeezing it and holding it away from its body until it dies. They have also been seen drowning their prey, holding it underwater until it stops moving. The hawks often pluck the feathers off their prey on a post or other perch. They also hunt songbirds at backyard feeders, perching nearby then swooping down and scattering the birds to single one out in flight. They may pursue prey on the ground by half running and half flying. Their breeding habitats are forested areas. The breeding pair builds a stick nest in large trees. Over a two-week period the pair builds the nest. The nests are piles of sticks around 70 cm (28 in) in diameter and 15–43 cm (5.9–16.9 in) high with a cup-shaped depression in the middle that is 20 cm (8 in) across and 10 cm (4 in) deep. Their nests are built in pines, oaks, Douglas firs, beeches, spruces, and other tree species usually on flat ground rather than on a hillside. The nests typically are about 7.6–15.1 m (25–50 ft) high off the ground, halfway up the tree, and out on a horizontal branch. The clutch size is usually 3 to 5 eggs. The cobalt-blue eggs average about 48 mm × 38 mm (1.9 in × 1.5 in) and weigh about 43 g (1.5 oz). The female incubates the eggs between 30 and 36 days. The hatchlings are about 28 g (0.99 oz) and 9 cm (3.5 in) long and are completely covered in white down. They are brooded for about two weeks by the female, while her mate forages for food. The fledging stage is reached at 25 to 34 days of age, though the offspring will return to the nest to be fed until they become independent around 8 weeks. Eggs and nestlings are preyed on, rarely, by raccoons, crows as well as other competing Cooper's hawks. Adults rarely fall prey to larger raptors, namely red-tailed hawks, great horned owls, peregrine falcons, prairie falcons, bald eagles, golden eagles, Eurasian eagle-owls and northern goshawks. At one time, Cooper's hawks were heavily hunted in persecution for preying on poultry and were called chicken hawks. It is now known that predation by these hawks on domestic animals borders on negligible, and they are rarely hunted currently. However, one threat facing Cooper's hawks today is the degradation and loss of habitat. Management activities like logging may make their former habitat unsuitable for breeding. 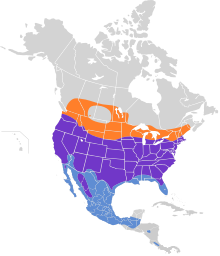 As a natural predator of almost any North American bird smaller than itself, the Cooper's hawk may inadvertently deplete populations of rarer, conservation-dependent species. The American kestrel, whose populations have experienced considerable decrease, may be one species which has suffered from the extensive predation of the recovered Cooper's hawk population. ^ Accipiter cooperii (Big Blue Darter). Zipcodezoo.com. Retrieved on 2011-12-18. ^ a b c d e f g h i "Cooper's Hawk". allaboutbirds.org. Lab. of Ornithology, Cornell University. ^ a b c d e f g h Dewey, T. and V. Perepelyuk. (2000). Accipiter cooperii, Animal Diversity Web. Accessed April 22, 2010. ^ "Avian Osteology: Tarsometatarsus". RoyalBCMuseum.bc.ca. Royal British Columbia Museum Corporation. Retrieved 2012-08-21. ^ Blake, Emmet Reid (1 July 1977). Manual of Neotropical Birds. University of Chicago Press. pp. 301–. ISBN 978-0-226-05641-8. Retrieved 21 August 2012. ^ "Cooper's Hawk Identification". allaboutbirds.org. Lab. of Ornithology, Cornell University. Retrieved August 21, 2012. ^ a b Global Raptor Information Network. (2010). Species account: Cooper's Hawk Accipiter cooperii. ^ "Cooper's Hawk". Cornell University. April 19, 2010. ^ "What is an American kestrel?". hawkmountain.org. Hawk Mountain Sanctuary. Retrieved January 28, 2017. Sibley, David (2000). The Sibley Guide to Birds. Knopf. pp. 112–113. ISBN 0-679-45122-6. "Accipiter cooperii". Integrated Taxonomic Information System. Retrieved 22 February 2009. Wikimedia Commons has media related to Cooper's Hawk. "Cooper's hawk media". Internet Bird Collection.